To install: extract all files, then run oalinst.exe. 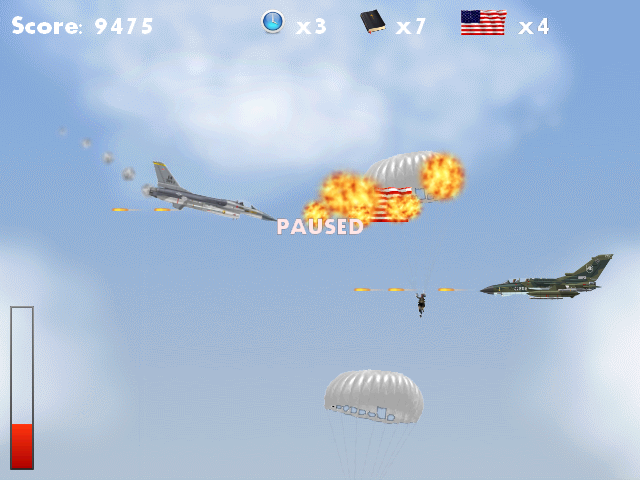 Military Entrance Mission is a shooter in which you are a United States Air Force trainee piloting a well-armed F16. You must pass through multiple stages and defeat hundreds of enemies, including your training instructor, all while obtaining permanent powerups. 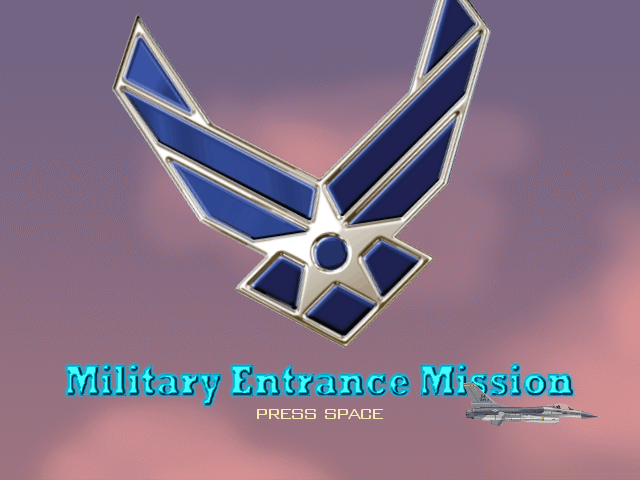 There are three stages and three difficulty settings (entry-level Air Force ranks), as well as at least one checkpoint in each stage. Use the arrow keys to move, the space bar to attack, and the enter key to pause the game. Version 1.0 enables you to play with certain USB game controllers. The maximum possible score without exploiting the boss is somewhere around 55,000 points. If you are defeated, you lose 1000 points and are sent back to the previous checkpoint, losing the powerups you obtained since then. F15s comprise the bulk of the enemy force. They may be armed with guns, including both rapid-fire and single shot, or missiles, including heat-seekers, or both. They are often protected by a Bullet Shield and may move in any of several patterns. Tornado fighters can be identical to F15s in behavior, but each Tornado carries a powerup. Mirage planes are primarily used as bombers, but they can also have guns and Bullet Shields. Air Shrapnel Bombs are flying explosive devices that, after a few seconds or when destroyed, launch pieces of damaging shrapnel in all directions. Point Defense Drones are defense units that use a laser to destroy incoming missiles. Magnetic Unmanned Aerial Vehicles are small aircraft that are vertically pulled toward your plane when it is nearby. Turrets aim directly at your plane. Each turret fires bullets or missiles, but not both. TI Joe is the training instructor. This unit has access to many abilities, including countermeasures. It is only vulnerable on the nose. 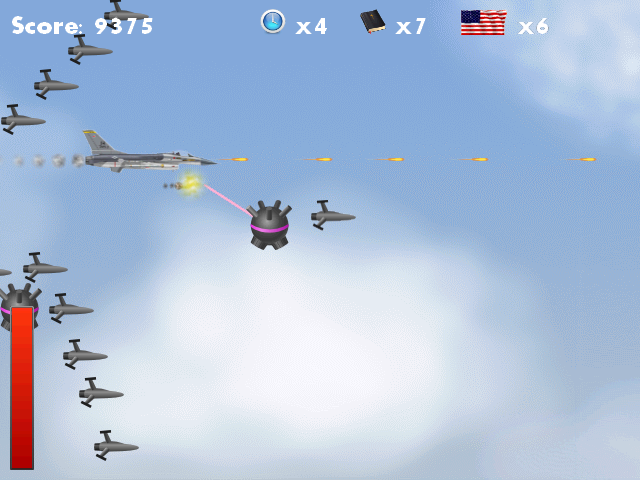 Powerups are permanent upgrades, usually contained by Tornado aircraft. Slow Missile (3) - Every eighth bullet you fire is paired with a missile. 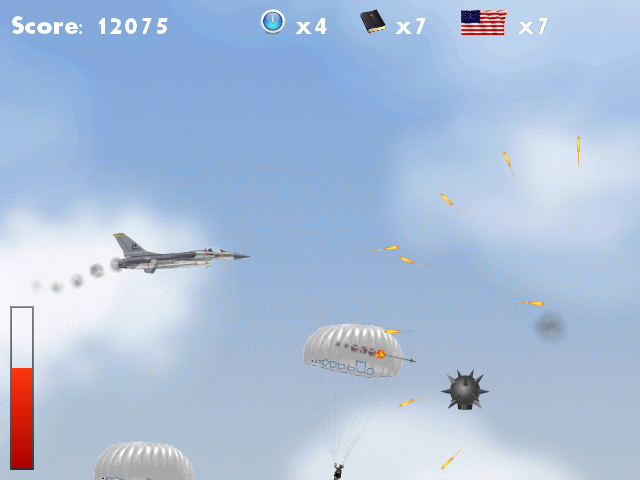 Fast Missile (6) - You fire a missile with every fourth bullet. 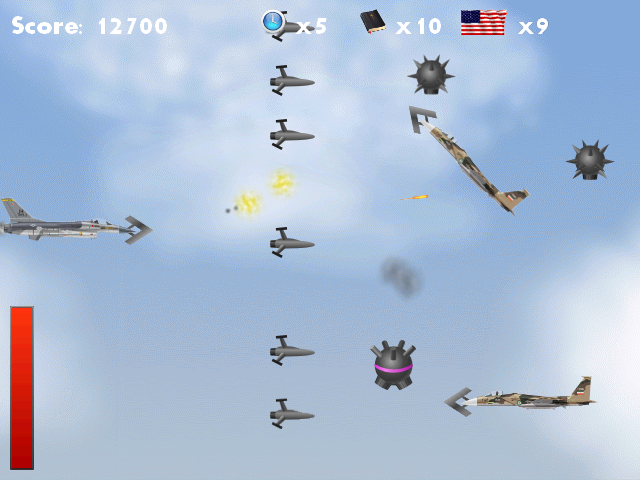 Adjusted Missile (11) - Your missiles will weakly guide themselves toward enemies. 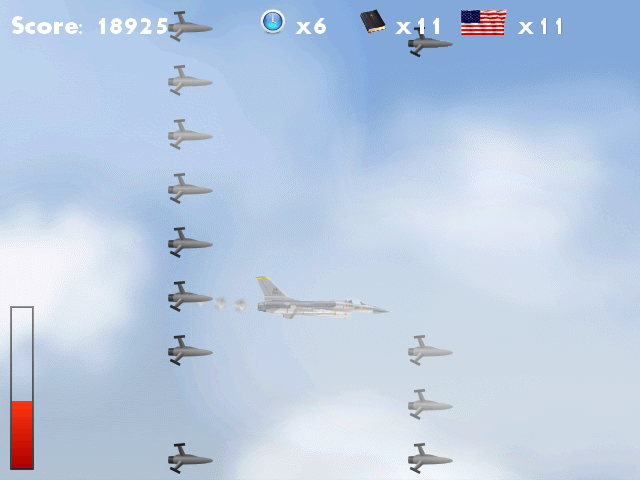 Guided Missile (18) - Your missiles seek enemies much more accurately. Bibles grant defensive power and repair your F16. +2 Max HP (3) - Your maximum hit points are increased by 2. Bullet Shield (8) - You obtain a Bullet Shield. This shield is invulnerable to bullets but can be easily destroyed otherwise. Point Defense Laser (18) - You obtain a point defense laser that can destroy up to one nearby enemy missile each second. Clocks increase the speed of your F16 in various aspects. +Vertical Speed (3) - Your maximum vertical speed and maximum pitch are both increased, as well as the rate at which your plane can change its pitch. +Horizontal Speed (6) - Increases your maximum horizontal speed. +Auto-Fire Speed (9) - Increases the speed of your auto-attack significantly, because by that point in the game, your trigger finger is probably going to be very tired. When fully upgraded, your F16 wears DeProgrammer's signature fedora.